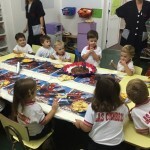 EN K3 FESTEJAMOS NUESTRO PRIMER CUMPLEAÑOS Y LA PASAMOS SUPER BIEN ¡¡¡QUE SEAS SIEMPRE MUY FELIZ CATA MOYANO!!! ¡¡¡TE QUEREMOS MUCHO!! !